There are seven legislative assembly constituency in Saharanpur district for the 2017 Assembly elections. They are Behat, Nakur, Saharanpur Nagar, Saharanpur, Deoband, Rampur Maniharan (SC), Gangoh. When Uttar Pradesh assembly election 2017 is getting ready to electios new Assembly, Saharanpur is not anywhere behind in the election heat. 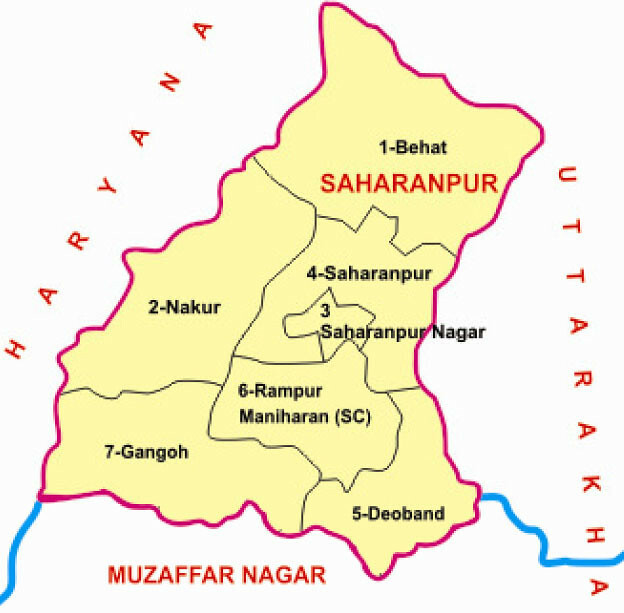 Saharanpur district (Hindi: ज़िला सहारनपुर, Urdu: ضلع سهارنپور) is the northernmost of the districts of Uttar Pradesh state, India. Bordering the states of Haryana and Uttarakhand, and close to the foothills of Shivalik range, it lies in the northern part of the Doab region. It is primarily an agricultural area. The district headquarters are Saharanpur city and it belongs to Saharanpur Division. Other principal towns are Behat, Deoband, Gangoh and Rampur Maniharan.